It feels like ages since I wrote a Mask Monday review (but really I only missed 1 week). This week I'm going to review a mask that was recently released. 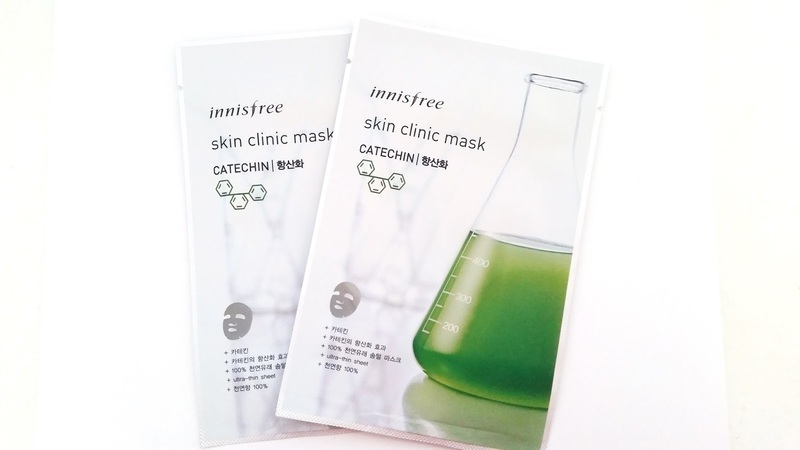 The Innisfree Skin Clinic mask in Catechin! 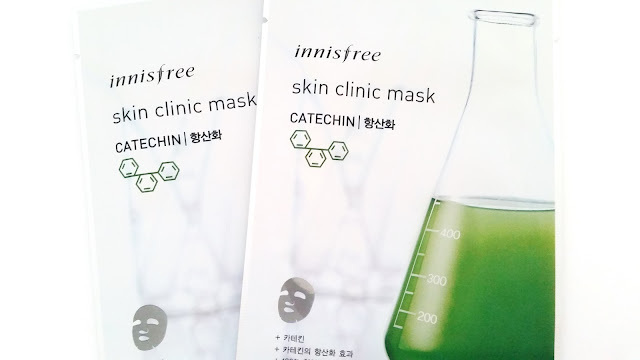 I was very excited to find that Innisfree came out with new sheet masks, although at first glance I was a bit confused. Innisfree prize itself in its use of natural ingredients, so the sight of chemically looking things took me by surprise. However, that doesn't mean they don't look interesting! While I was excited to try some of their new Skin Clinic masks, I was unsure of the others. Still I picked them all up to try, just in case. Product Description: A sheet mask created with 100% natural cotton. It's dual functional benefits contains anti-oxidants of catechin to balance skin tone and provide wrinkle care. The mask also contains niaciamide and adenosine to care for dull skin and wrinkle issues. To Use: Cleanse and tone the face first. 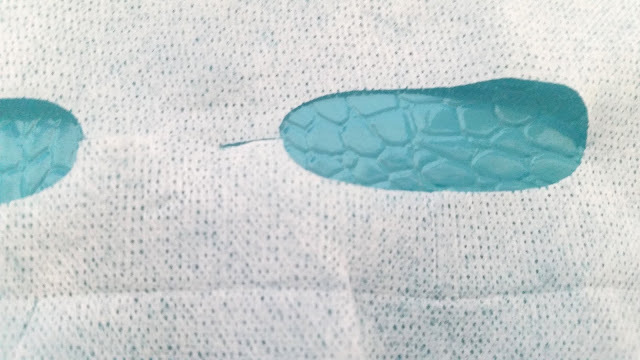 Take the sheet mask out of its packaging and remove its protective film. 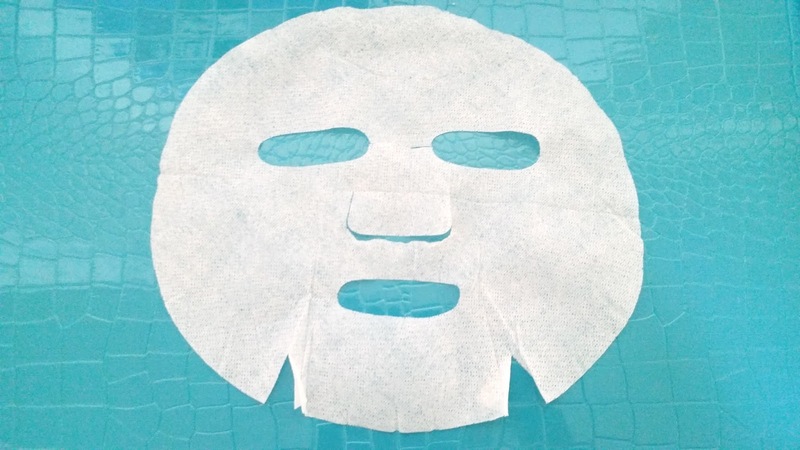 Apply the sheet mask onto the face evenly and leave it on for 10 to 20 minutes. Remove the mask after the allotted time and pat in any remaining essence. Ingredients: Water, Butylene Glycol, Dipropylene Glycol, Niacinamide, 1,2-Hexanediol, Citrus Paradisi (Grapefruit) Fruit Extract, Glycereth-26, Betaine, Carbomer, Arginine, PEG-60 Hydrogenated Castor Oil, Cellulose Gum, Adenosine, Glycerin, Citrus Unshiu Peel Extract, Orchid Extract, Camellia Sinensis Leaf Extract, Camellia Japonica Leaf Extract, Opuntia Coccinellifera Fruit Extract, Citrus Aurantium Bergamia (Bergamot) Fruit Oil, Lavandula Angustifolia (Lavender) Oil, Citrus Aurantium Dulcis (Orange) Peel Oil, Disodium EDTA. 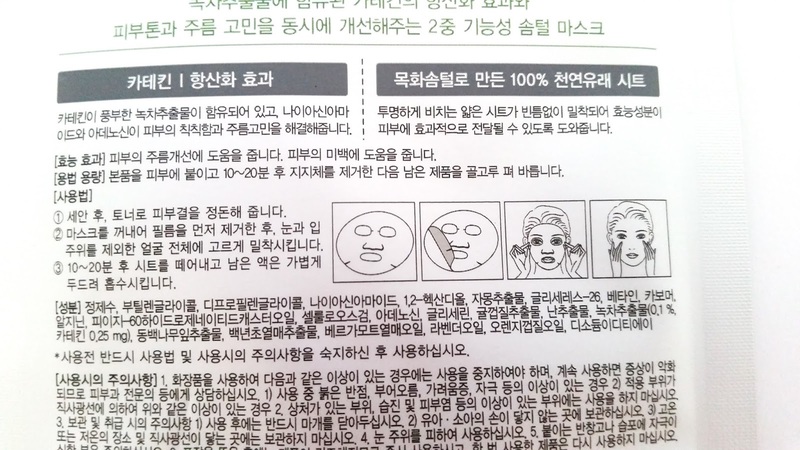 Diagram on how to apply the sheet mask. My Thoughts: With all new masks, the first thing I do is patch test. Once the patch test is done, I'll try the sheet mask on full force. The first things I noticed about the mask was that there's a lot of serum. 20ml is generally how much serum most Innisfree sheet masks come with, so I was happy with that. The mask has a strong herbal scent. While I don't mind some herbal scents (many Innisfree products have that distinctive Innisfree herbal scent that's a bit sweet), this one was just a bit too herbal and strong for me. I can actually pick up the lavender scent (lavender oil is one of the ingredients) and a bit of citrus among the herbal scents too. Even after the sheet mask has been sitting on my face for a few minutes, the scents were still rather strong. 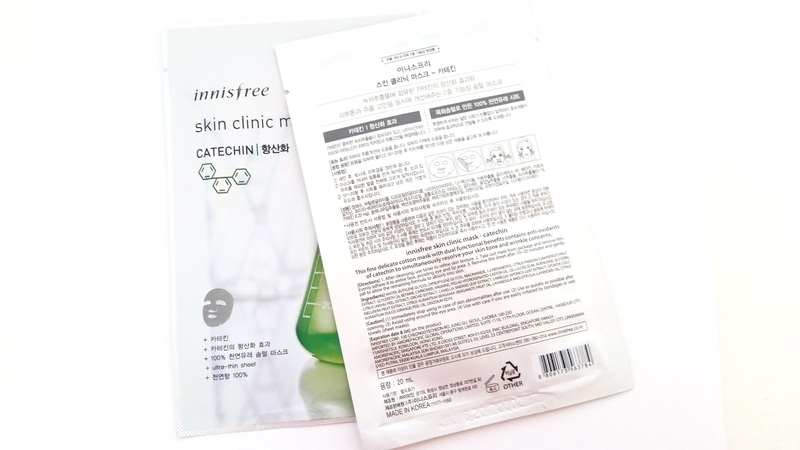 Something different about the Skin Clinic masks from other Innisfree sheet masks is the sheet of the mask. It's made with 100% natural cotton material. It is very thin, even a bit thinner than Innisfree's It's Real Squeeze line. 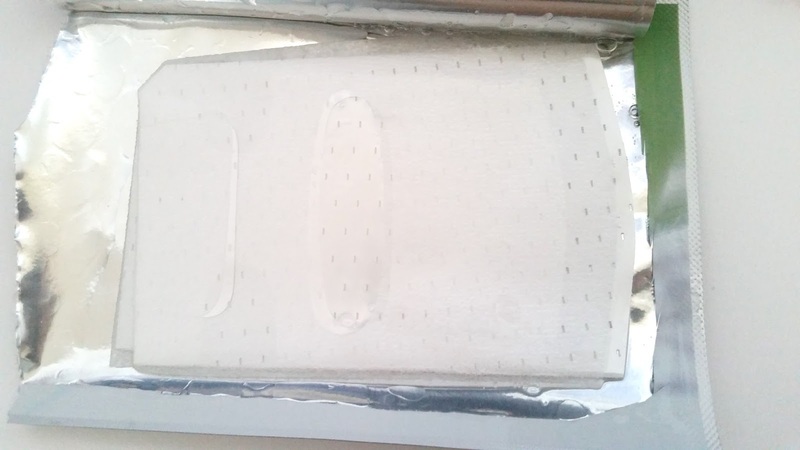 The thin mask sheet was able to adhere to my face easily and it stayed put. The only down side to the sheet mask for me was that the sheet mask is not easily adjustable. I can't just tear it to fit my face. If I want to make adjustments, I'd have to cut it or fold it. The essence on the mask also dried faster than other Innisfree masks I've tried. The plus side of this mask is how moisturized my faced felt after I used it. A quick look at its ingredients will tell you that most of them are moisturizers. The mask felt cool and soothing on my face, which was nice. The mask promised to even out skin tones and provide wrinkle care. While I don't have wrinkles, I do have some fine lines. The mask did nothing for them. It did brighten my skin tone a bit, but nothing more. I was really expecting something more, since this is more expensive than the It's Real Squeeze line, however, I was rather disappointed. To be honest, I'm not exactly sure what I was expecting from this mask. I did want it to do more than moisturize and brighten the skin, which a lot of masks cheaper than this one already do. I was disappointed that it didn't help with my fine lines. I know they are not exactly the same as wrinkles, however preventing and caring for them are generally the same. What the sheet mask looks like on the inside of the package. It comes with a protective plastic film. Packaging: Beakers and chemicals have replaced the natural ingredient images on this Innisfree mask's packaging. A bit unexpected but some how it doesn't look bad. The packaging design is very simple, like most Innisfree masks. It features the 'main ingredient' as the image and mentions the functions of the mask. 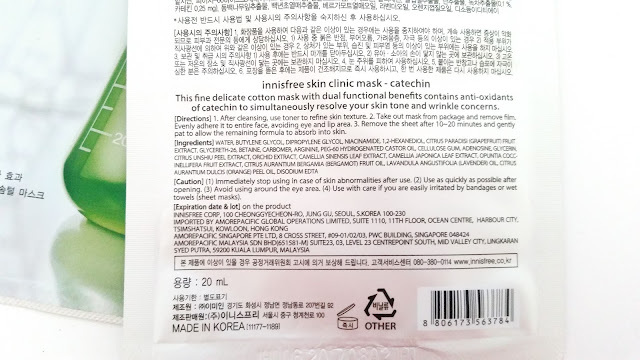 While those listed functions are in Korean, the back of the sheet mask comes with English and Korean instructions/ingredients. Scent: Herbal, might be too strong for some (like me!). I was able to pick out the lavender oil scent as well as a bit of citrus scent. While most Innisfree products comes with that distinctive Innisfree herbal scent, this one was stronger, so might not be suitable for some people. Color: The essence is clear and the cotton sheet mask is white. Texture: The sheet mask felt very nice when it was soaked in essence. It was nice and soft. Once the mask begins to dry, it becomes a bit stiff and not as soft as it was. 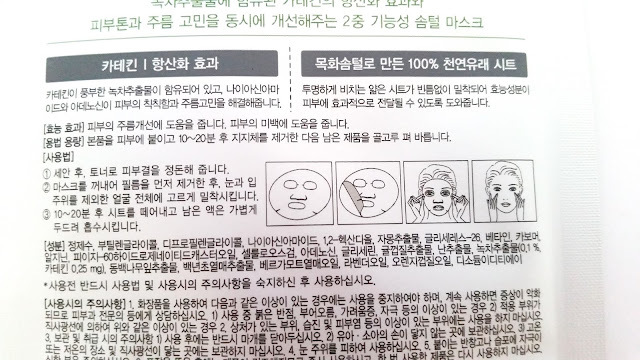 Close up of the sheet mask. Final Thoughts: I was quite disappointed by this mask. While I expected more, I really expected it to fulfill its promises of skin tone care and wrinkle/fine lines care. Unfortunately, it only brightened my skin a bit and nothing more. It is a moisturizing mask, but there are plenty of cheaper masks on the market that moisturize just as well, so it felt like a bit of a waste of money. The Skin Clinic mask in Catechin also came with a rather strong herbal scent, which I wasn't a fan of. I can image others like me who wouldn't like the strong herbal scent as well. A lot of my dislikes of this mask are personal preference, still I gave the mask 3 hearts out of 5 because it really doesn't deserve more. For its price of $2.20, it should have better wrinkle/fine lines care and also even out the skin tone a bit more. Instead, it felt less than a It's Real Squeeze mask, which is disappointing. Would I purchase this in the future? Probably not. There are other masks from the Skin Clinic line that I look forward to trying. I hope they work better for me than this Catechin one. What are your thoughts on these Innisfree Skin Clinic Masks? Would you like to try them?